Is there more to why you bond with a song you really like? Think of this as a “Part II” continuation of sorts, on public perception and reception of music based on the (type of) vulnerability offered in songwriting. Delving further into a new angle of my previous post tackling public perception of, reaction and reception toward or away from music, I was left with self-generated queries contemplating the nature of the public’s varying levels of appreciation for, and connection with, today’s publicly open artists. It has been said time and time again that the added sprinkle of sincere thought or an emotion you can relate to, whether in a song, at a meet and greet or in an interview, usually helps create or enhance a positive bond with an artist’s fans. I only breached the quandary of howpeople work to discern the kind of transparency they want that leads to lasting appreciation. However, knowing that transparency itself is generally the key, the question shifts to ask what kind of substance exactly, is typically at hand to make such connections happen –not to mention, asking the question of what it means to feel true appreciation/admiration for an artist in the first place. Attempting to answer these questions might sound like a rabbit hole of completely subjective framing but really, it could very well be put forth with a seriously scientific spin. 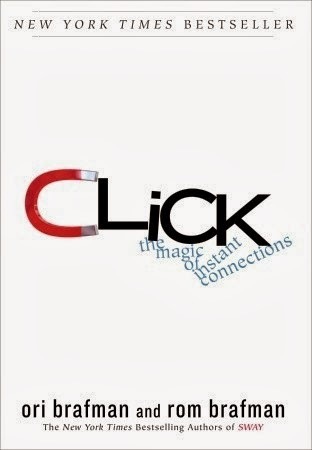 Click: The Magic of Instant Connections, a book written in 2010 by two scholarly brothers, whose knowledge deeply penetrates the fields of psychology and sociology, addresses the different angles and questions surrounding how and why people forge what feels like an immediate click. This isn’t a book rooted exclusively in romantic connections and it discusses different scenarios that illustrate click relationships or circumstances that generate such. During the course of the book, the Brafman brothers also illuminate the pieces that make up click relationships, providing a scale of sorts that reveals how intense the things we say to each other are, and how likely each are, to prompting a deeper and or longer lasting connection. While the cumulative collage of what creates or sustains an instant connection involves several other factors, (in other words, I can’t summarize the entire book,) the main element that struck me, is that of the “vulnerability spectrum” in the earlier half of the book. Songwriting and subsequently song reception by strangers who hear things over the internet or on the radio, is all aboutvulnerability. Even for the most commercially designed can-of-SPAM pop song, spoon fed to local radio stations for profit, if at least one person likes and hears details they feel mirror their own thoughts or experiences, no matter how generalized in lyric form, that listener connects a more personal part of themselves or their memories, with the music and as such, appreciate it. Therefore, regardless of whether the vulnerability comes from within the songwriter in the composition of the tune or whether the song is formulaic and predictable but still conveys and extracts personal elements from a fan, vulnerability is still there. The millions and millions of fans and individual stories there are in world, reasons for relating to a song, are just as myriad, if not infinite. However, for the songwriter/musician, and for the fans that come to disclose much more serious connections with an artist because of a particular set of songs or albums, where on the spectrum do the feelings of either side fit? As explained in “Click,” there are five general levels of vulnerability, with the five levels split into two groups: transitional “communication that conveys thought-oriented, as opposed to emotional) information”and then connective interactions. Phatic:non-emotional statements or “social niceties” not necessarily desiring a response. Factual:The disclosure of basic, objective data that prompts little to no strong opinions. Peak:Divulging of one’s innermost thoughts and emotions, via statements that bring the highest amount of risk with regards to how (and how extremely) another party could react. It would seem as though over the course of fostering a relationship with someone else, the gut-level wouldn’t be approached early on unless perhaps other “click accelerators” as the brothers mention prior, are in play and create such conditions. Without having to go over every other click accelerating factor, knowing that beyond the occasional meet and greet of super rare “see them on the sidewalk and grab a snap shot” scenario, it is a given for the majority of fans that connections only go as far as listening, pictures and social media. This in mind, it would make sense that the more deeply revealing stages would reamain irrelevant in the musician/fan relationship right? Where from then, does the joint musician-music affinity come? Adding even more to this growing question, are the entire introduction of things like Twitter, Instagram, Vine, Tumblr etc., to the lives of musicians, a big part of what is generating this strong “thing” between an artist an fan –something that might not be there, or not be there with nearly as much intensity, if we did not have the widespread and first-degree ability to hear and see a musician’s life outside of their songs? Perhaps the fact that musicians are so ‘untouchable’ amplifies the perceived level of offered vunerability, even if the information put out there does not necessarily fit the profile for gut-level disclosure and that intimately-laced emotion within fans is subsuequently carried over into song lyrics. Of course, there is also the idea that pouring your heart on the page and choosing to let the world hear what is indeed a fully personal, highly divulgent and possibly “peak” level song, just bypasses any need for investigation or detangling of interpersonal connective lines between the fans and the musician because sometimes, in the music business, people put heavy things out there and that’s all it is: putting a heavy song out there and suddenly the world knows a very private-now-public thing about you and they feel close to you for doing it. That or, they at least feel a close sense of empathy if applicable to their lives. Maybe the entirety of the more commerical side of songwriting could be infused with new life and transformed to feel less hollow, forced or generic if some aspect of these ‘click principles’ could be applied to the actual composition process. After all, there are courses in songwriting offered all over the world and there is a defintie craft to how a “standard” commercial song is formed. I’m not sure how and where things would need to be adjusted, as coming up with a good rhyme, to fit a good rhythm, to fit a good melody can alrady feel like a rarity at times, but hey, if songwriting itself could manage to evolve, maybe so will our perceptions of what we as a modern society like and then artistic trends in the indsutry might dramatically (meaning less predictibly) change as well. Knowing what you do now about this vunerability rubric, do you feel your songwriting process fits on it somwhere? Thinking retrospectively, do you consciously and intentionally aim to place your lyrical construct on it, even though you might not have known the terminology for it until now?